The Soup Kitchen rules. It’s been around FOREVER, with good reason. If you ever make it to SLC, take a trip to this little spot. My favorite items: SOUP (tomato and clam chowder are my faves), the take-as-many-as-you-want breadsticks (garlic are SOOOOO good), and the scones with honey and butter for dessert (not to be confused with english scones, these are like navajo fry bread). For those of you out there who haven’t been to Utah, you will see from my pictures that The Soup Kitchen also offers a local favorite – FRY SAUCE. All the burger places around here have this stuff – I personally think it is GREAT. It’s pretty much ketchup and mayo mixed together with some seasonings. It tastes better than how I’m describing it – I promise! I didn’t get a chance to go to The Pie Pizzeria on this trip, but this is another dive-y type food joint near the University of Utah that is mighty fine. I could just order the Cheese Pull-A-Part and be happy. Now that I mention it, I’m getting a little sad I’m not eating those pull-a-parts right now. To get SO CLOSE and be denied…ah, the agony. I’ve never tried the Soup Kitchen! Then again, I haven’t been to Salt Lake for 6 years. Have you tried that cool food area that is really cheap and food from all over the world where everyone cleans their own place and stuff? World something? I’m new to the blog and love it. I live in Kansas, but am from Utah and agree that the Soup Kitchen rocks! Yum!!! You have to go to Nielsen’s Frozen Custard and have a Turkey Grinder and chocolate custard. 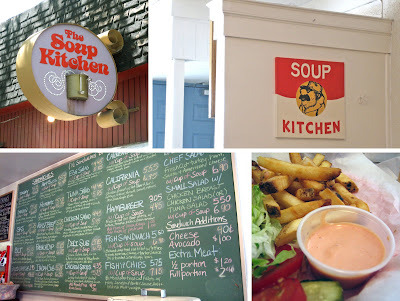 You are making me homesick for some of my favorite Utah eats… I love the soup kitchen! You’re lucky to find such great food at such great prices. The soup kitchens are wonderful! I live here in salt lake and its one of our favorite places. And I have to say, life without fry sauce is unheard of!